New York Fashion Week may have come to a close, but the hottest looks from the eco-fashion runways are still fresh in our minds. (It doesn't hurt that we have so many exclusive pics to refresh our memories, either). From cozy knits to flowy dresses, click through our photo gallery to check out six of our favorite green designers who gave sustainable style a good name this season. 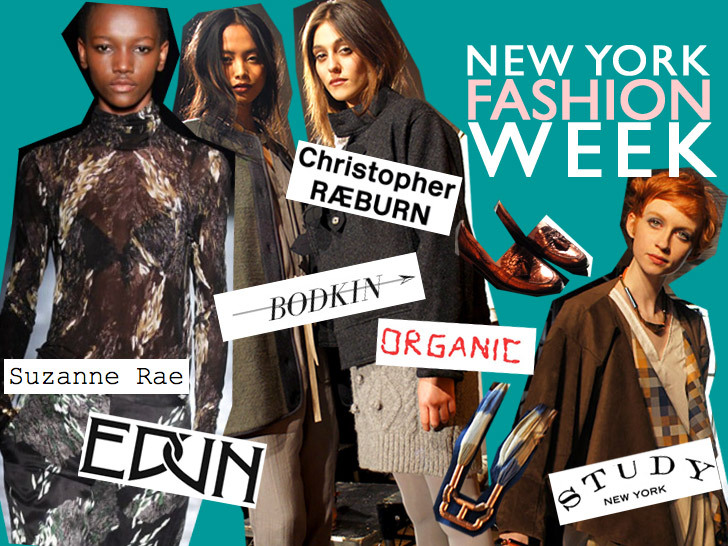 We checked out the eco-fashion lines that have been making a name for themselves for Fall/Winter 2011, including Bodkin, Study NY, EDUN, Suzanne Rae, Christopher Raeburn, and the always classic Organic by John Patrick. What we found were sophisticated, easy-to-wear cold-weather silhouettes in soft, sustainable fabrics. Click through our slideshow for a roundup of our favorite looks. Eviana Hartman's Bodkin brought the house down with its wearable minimalist separates. We loved this resurrected Quasar coat from Fall 2010 even more now that it comes in reclaimed wool. "One of the best things about winter is that you can throw on a luxurious coat like this one and pull your whole look together (no matter what hot mess is going on underneath it)," opined senior editor Yuka Yoneda. "Plus, it's a great excuse to tell people it's made of reclaimed wool and recycled polyester when they stop to compliment you on it." This ethereal seafoam dress was managing editor Jasmin Malik Chua's favorite fashion-week piece. "When it comes to fashion, you want to look utterly effortless," she says. "This dress cuts a clean silhouette that requires little adornment, and the seafoam hue is absolutely dreamy, like something Daisy Buchanan from The Great Gatsby would wear." Oh, John Patrick. You never cease to amaze us with your easy appeal. Brit Liggett, our contributing writer, for one, approves. "After I moved to New York City I realized that there is one cliché about this place that is true: black is a wardrobe staple," she says. "That's why I love outfits like this; it's not about the color but the layering of texture. Cozy, casual and totally street worthy—I'd rock these duds every day." Victoria Klein is a fan of the lace short, as well. "This would be a perfect addition to my mix-and-match wardrobe," she says. "Plus, it isn't super-short—I'm so sick of short skirts!" Patrick's twist on the English countryside was most apparent with this floral silk dress, which he paired with lace-up Hunter wellies and knee-high socks. The collegiate look is something contributing writer Bridgette Meinhold thinks she can pull off. She describes her style as "mountain casual." Like Bodkin, Organic's fall line was chockfull of chunky, cocoon-like handknits with cable and ribbed details. Study NY took us back to school with props like chalkboards and crisp, red apples. The label's hand-knit alpaca tube skirt was contributing writer Kestrel Jenkin's pick of looks. "Tara combined an on-trend maxi skirt with handmade knitwear," she says. "This piece translates into such a simple yet ingenious merging of fashion, function, and air trade. I cannot wait to snuggle into this skirt when the next autumn leaves fall." Designer Tara St. James enlisted the aid of organizations such as CPALI, a nonprofit that works to prevent deforestation in Madagascar, and Madres & Artesanas, a women's cooperative in Bolivia, to craft her ethically produced ensembles. St. James took the DIY route when it came to accessorizing her looks. Her assistant made this necklace out of scrap fabric and secondhand copper piping. Brooklyn designer Suzanne Rae feted a line of ensembles that she dubbed "victorian gone grunge"—part hipster street urchin, part ladylike sophisticate. Menswear-inspired tailoring gets the feminine treatment with smartly cut suits that hang on the body just so. Here's a dress we could totally see Michelle Obama wearing to a state function—and it's made in Brooklyn by an American designer, so Oscar de la Renta should approve. EDUN's "Storytellers and Liars" collection was a gothic fairy tale that blurred the lines between fantasy and reality. U2 frontman Bono co-founded EDUN with his wife, Ali Hewson, so it's no surprise that designer Sharon Wauchob infused a bit of rock-and-roll spirit into the mix while staying true to the label's African roots. The combination of airy printed silks and snuggly intarsia knits was completely unexpected but wholly welcome. We're suckers for a good coat at Ecouterre. This oversized bomber-inspired topper is a keeper. British designer Christopher Raeburn didn't have a show per se, but he did use New York Fashion Week to kick off his upcycled-outerwear collaboration with Victorinox, maker of the official Swiss Army Knife.